Like most people when shopping I always find something that I fall in love with but is way out of my price range. I'm not sure about you but I can not justify spending $480 on a sweater that I'll either shrink or poke a hole in it eventually. Maybe in a different life but in this life paying a prince tag that high for one item is just ludicrous. But even with a price tag that high it's still fun to drool over and dream of owning certain items. Today's shopping list is my Luxe Wish List- items I would die to have but will never be able to afford or justify buying. 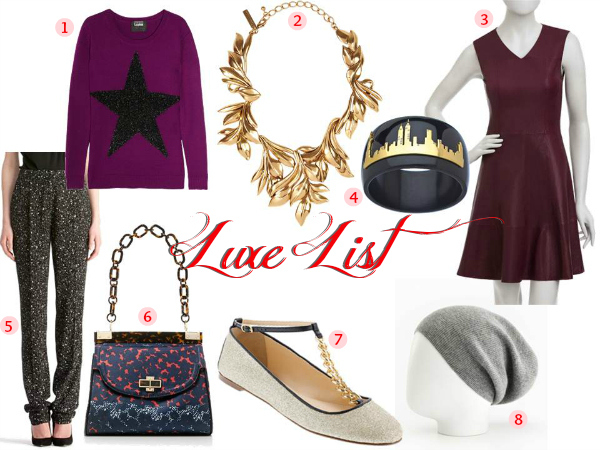 Do you have a "luxe wish list"? If so, what's on your list? That NY bangle is on my must have list! Reminds me of running the marathon last year! Of course my favorite is the most expensive thing on your list...the leather dress!